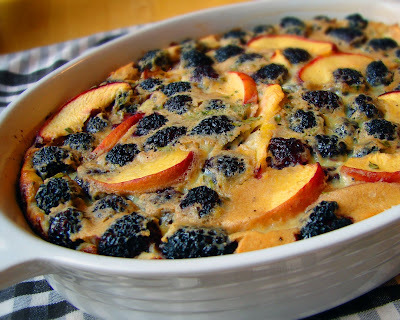 Recipes Cooking: Peach and Blackberry Flognarde As Delicious to Eat as it is Fun to Say! Peach and Blackberry Flognarde As Delicious to Eat as it is Fun to Say! I was looking around for a name for this unusual clafouti-like combination of peaches, blackberries, thyme and black pepper, when I saw an article that said in France, a clafouti that uses fruit other than cherries is called a flognarde. A flognarde? Yes, a flognarde. I enjoy saying flognarde so much, I think even if this recipe hadnt come out as well as it did, I would have still made it regularly - just to say, flognarde. As I mentioned in the video, I couldnt find a proper French pronunciation, so please enlighten me on how it should really sound. Until then, Im going with "flog-nard." This recipe is dedicated to the more adventurous among you. I knew going in that the thought of adding black pepper and thyme to a dessert-ish recipe would freak some of you out. But, thats okay. The pepper gives this a very subtle hint of heat, and the thyme adds an almost unperceivable herbaceous, slightly lemony aroma. Is this something you will enjoy? There is really only one way to know. Enjoy!